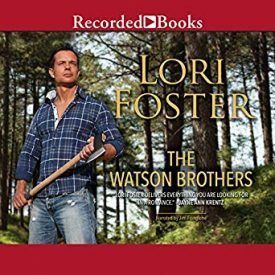 Bringing Up Baby is featured in the anthology The Watson Brothers and is not available on its own. Gil Watson was both nervous and excited-an odd combination he hadn’t experienced since his first years of college. These days he was confidence personified, commanding even, an in-charge guy perfect for the corporate world. He prided himself on his professional demeanor, his calm outlook on life. He had a business to run for his family; they relied on him and he enjoyed that.He’d grown up – and in the process permanently buried all wild inclinations. But today, the figures blurred on the computer screen in front of him. He wasn’t getting much work done, which seemed to be the norm of late, rather than the exception. It had taken only one phone call to throw him off track, but then, it wasn’t every day a man learned he had a daughter, a daughter he hadn’t known of until two weeks ago. He hadn’t been the same since. Would she look like him? At two and a half years, was a child developed enough to look like anyone? What he knew about babies wouldn’t fill a thimble. At thirty-two, he concentrated on knowing business, family responsibility, and finances.And not to brag, he also knew women. But he knew zilch about being a father. It still boggled his mind that Shelly had never said a word.He saw her two or three times a year, whenever business took him to Atlanta. He’d been to her office, to her home, met her coworkers and friends. Right after his father’s death three years ago, he’d been so sick at heart that he’d done things he wasn’t proud of. Not that she hadn’t been willing. She’d sent him one of her looks and he’d reciprocated, and within the hour they’d gone from business associates to lovers. He still remembered the wild, frenzied way she’d taken him. For two days, he kept her in his motel room burning up the sheets. She’d catered to his sexual needs, his fantasies, and even his less than orthodox demands-the demands he’d thought well under control. She’d been everything he’d physically wanted and needed at the time. In truth, she’d wrung him out and left his body and mind thankfully blank for an entire weekend, relieving his sense of loss for his father, obliterating his concern about taking over the family business and the overwhelming responsibilities he’d accepted as his own. It was when he’d awakened and saw her looming over him,smiling with too much emotion for a mere sexual coupling,that Gil had realized his mistake. Shelly wanted a husband and apparently saw him as a prime candidate. But he didn’t want the burden of a wife added to the new load he already carried. His oldest brother was a cop, his youngest brother still in school, and his mother had never involved herself with the company. Taking over the successful family novelty business and keeping them all financially solvent had naturally fallen to Gil. Outwardly, he was the most staid, the only one who’d shown an interest, his father’s protégé. No, the last thing he’d wanted was a wife to further muddy the waters, so he’d done what he considered wise and responsible.He’d gently explained his lack of interest and had never again touched Shelly sexually. Yet she’d had his baby and continued to associate with him as a close friend. Without once ever telling him. Gil’s stomach clenched over such a deception. He hadn’t known, damn it, but that was no excuse. Shelly had taken care of their baby alone and now she was gone. He couldn’t make things right by her-but he could raise their daughter. And he would. Giving up, he closed out the computer program and leaned back in his chair, his mind churning with regrets and curiosity and that persistent nervousness. A baby, his baby. Jesus. Every muscle in Gil’s body went rigid. His brain cramped. His daughter was here-with Anabel-two weeks early. He rounded his desk with a long stride. Damn Anabel, he’d offered to come to her, to buy her airline tickets, to pay for their transportation. As contrary and outrageous as ever, she’d refused, telling him it’d be at least ten days before she could leave. Ten long days before he’d get to meet his baby. Arms crossed and eyebrows lifted, Alice moved out of his way as Gil charged forward. If this was a deliberate ploy on Anabel’s part to discredit him, he’d-well, he didn’t know what he’d do yet, but he’d think of something. Because Anabel had been Shelly’s roommate, he’d known her as long as he’d known Shelly. She was always there when he visited, always twitting him, picking at him. Her presence was always unnerving; she made him think things he shouldn’t think, things he had tried not to think now that he had new responsibilities to consider. As Shelly’s best friend, she’d been off-limits then. But no more. He threw the door wide and then froze, his heart shooting into his throat, his stomach dropping, his knees almost giving out. Damn it, why did Anabel have that effect on him? She looked the same as always: seductive. He’d never really liked her. She was too outspoken and pushy. Too overtly sexual and in your face. Too… hot. She was one of those women you just knew would be incredible in the sack and it made him nuts. It wasn’t just her jewelry, her overdone makeup and risqué clothing that had made her far too difficult to ignore. There’d been something about the way she watched him, too, her close attention, the carnality in her gaze that made him wonder if their basic natures might mesh. That thought had kept him on edge whenever he was around her. Now he realized that she might have Watched him for the simple reason that he was Nicole’s father and didn’t know it. He might have totally misread her. When she’d called, her tone had been devoid of accusation,empty of any real emotion when usually she teemed with emotion. She’d told him of Shelly’s death, of his baby girl, all with a detachment that had left him bewildered and floundering-a situation he didn’t like one bit. He was used to being in charge, of knowing what he did and why and having no doubts whatsoever. Did it matter to Anabel that he hadn’t known of the baby? She stood there now in low-slung, faded jeans, a clinging stretch top of bright pink and… oh God, she had a belly button ring. He fixated on that for what seemed like an inordinate amount of time before he heard her low, throaty laugh. He jerked his gaze up to her face. “I know.” She grinned, and that grin was so teasing that Gil felt it like a tactile touch. Then he saw the exhaustion she tried to mask, the utter weariness in every line of her body. At the sound of his voice, a pale face surrounded by dark curls peeked out from behind Anabel’s knees. Until that moment, Gil hadn’t noticed the tiny hands hugging around her legs, the little bare feet behind hers. The baby, his baby, was hiding. Mommy? Taken aback, Gil lifted a brow and looked to Anabel for some explanation. Little rat? But the child had a stranglehold on Anabel that she couldn’t pry loose, so it didn’t appear she’d taken offense at the less than complimentary endearment. Disappointment shook him, but Gil hid it. At least he hoped he did. He rose slowly to his feet again. “Come into my office.” Stepping back, he held the door open until Anabel had swept past him. He could feel her energy, detect her light flowery scent. Behind on his office floor she’d left a large colorful bag overflowing with a tattered stuffed bear, a faded print blanket,a squeeze bottle of juice, and other baby paraphernalia. Blank-brained, at an utter loss, Gil looked at Alice. “Thank you.” Gil stepped into his office, shut the door, and tried to figure out what to do next. He silently tallied the facts at hand: Anabel was here, a woman he shouldn’t have wanted,but did. His daughter was here, a child he’d only just found out about but already cherished. His life was about to undergo some drastic changes. He had to do something-but all he managed was to stand there, watching the two of them. Anabel had sprawled in his black leather desk chair, the child on her lap, and she was whispering in Nicole’s ear, kissing her downy cheek, and rubbing her narrow back. Gil wanted to hold her. He wanted to cuddle his child and know her and let her know him. The feeling was so alien, yet so powerful, Gil naturally shied away from it. With that accomplished, Gil settled back, linking his fingers and resting his hands on his thighs. The pose was relaxed when he felt anything but. He made note of so many things at once. The dark circles under Anabel’s green eyes, the windblown disarray of her short, fawn-colored hair. The row of hoop earrings in her left ear, each increasing in size. Five total,he counted, the largest about as big as a quarter. A tattoo circled her upper arm. It appeared to be a horizontal flower vine, but it was too delicate for him to be sure without leaning forward for a closer look. And he wasn’t about to get that close to her. Nicole twisted slightly to see him, but she kept her nose stuck in Anabel’s neck, her arms locked around her. Her round eyes were huge and wary. He badly wanted to touch her, and he didn’t deny himself. Slowly reaching out with only one finger, he stroked the silky soft hair over her temple. His heart threatened to punch through his chest. She shied away, going back into hiding and gripping Anabel with new fervor. Toward the end? The end of what? Shelly had died suddenly of a car wreck, Anabel had told him. What did she mean, then? But his questions would have to wait until Nicole wasn’t listening. He didn’t know how much a child her age might comprehend, and he wouldn’t risk adding to her trauma. “Juice,” Nicole mimicked. She stuck out one skinny arm in demand, grasping at the air with her tiny fingers. “My pleasure.” Alice retreated from the room. “She doesn’t like it cold, do you, Nicki?” Nicole didn’t answer. She had the squeeze bottle tipped up, guzzling away until juice ran down her chin. Anabel quickly put her coffee aside to relieve her of the drink. Eyelids drooping, Nicole turned to her side, put her head in Anabel’s lap, and just that easily, dozed off.